This is a technique we have been talking about doing for a while. 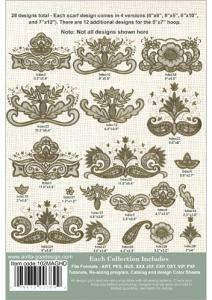 These are beautiful vintage designs that were created to hang over the edge of fabric to create scalloped borders. The uses for these designs were obvious at first, tablecloth edges and table runners. We decided to go a different route and use them to create scarves. 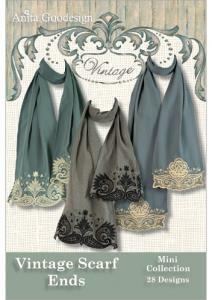 Scarves are perfect accessories all year and they are very easy to make. The main project for this collection is a scarf, but the designs also work well for tablecloth borders, table runners, and place mats and also as an insert for clothing.